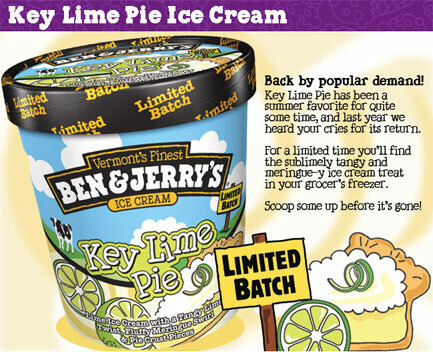 So we've got Ben & Jerry's Limited Edition Key Lime Pie that has been out since June. It's Lime (yes Lime) ice cream with a Tangy Lime Twist, Fluffy Meringue Swirl & Pie Crust Pieces. I was sure that I wouldn't waste my money on it, but the other day it was just sitting on that shelf saying "come on, I'm only three bucks". So I brought him home. I figure worst case I take a few bites and then try to pawn it off on the family. Well, I can admit that I was wrong, so very wrong about this flavor. Yes it's strong, but the lime, the meringue, and the crust come together so well that I feel plain old silly for not having tried this when it came out. I should have trusted Ben & Jerry's, but I let my own fear of tart get in the way. Let's get more specific: I am downright shocked at how strong the crust flavor is. I love crust, it's the crunchy part of any good pie that ties everything together and some how B&J's has got that flavor in every bite. I pretty much always complain that there's never enough crust in a flavor, but not here, no no, this one is done perfectly. 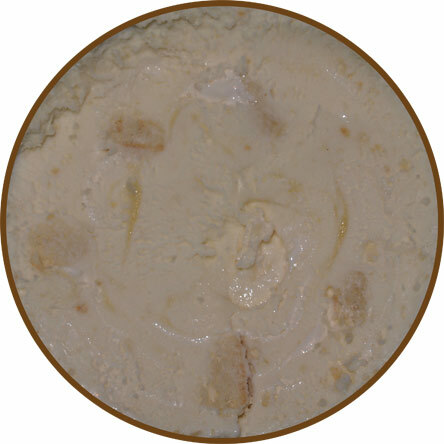 It's a true crust flavor, complete with grit and just ties this whole pint together bite by bite. Next we've got the very distinct meringue flavor. It's that white goo swirled all about in the photo above. It's strong, soft, and again, it's in every bite. It's not a hint, it's not an undertone, it's a big fluffy topping and it's there again and again and again. Awesome. The crust and meringue would be nothing without the lime base to tie it all together. It is strong? yes. It is tart? at times, yes - probably when you hit the little streaks of lime "twist". Is this strong, tart, prevalent lime flavor bugging me? Surprisingly, no, it's not. I've never actually had key lime pie, but I've had lemon meringue pie on several occasions and this very much reminds me of a top notch LM pie. (It also kind of reminds me of this tasty lime jell-o mold my mom use to make, but that's another story). You know, I bet if you blindfolded someone and gave this too them, they would be like "hey, did you freeze your key lime pie?". Well, that's what they would say between inhaling this excellent flavor. I really really like this one because it does such a good job of bringing pie to life. I could easily go for a second small helping of it (I did on the second scoop actually). This one is pie first and that's such a nice contrast to the failed Boston Cream Pie flavor. I can't say it enough, every bite is a wonderful balance of all three flavors. Nice job Ben & Jerry's. You know, this blog has never been just about eating ice cream. It's about finding (and sharing) the courage to try new things. I have tried hundreds of treats but that doesn't mean I still don't have my preconceived notions about what something should or will taste like. 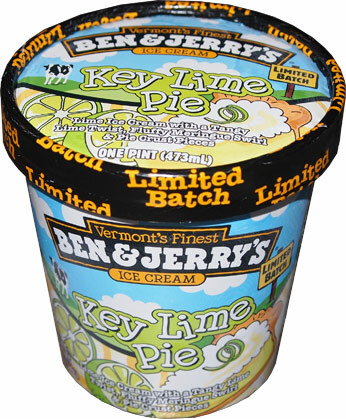 Key Lime Pie is a classic example of being afraid of something that is quite tasty. If you are afraid to spend $5 to try it, then find a place where it's on sale. If you are afraid you'll waste it, find someone to share it with. Yes, be happy with your favorites, but remember to try something new now and then. Verdict? A Pie flavor done right! My daughter would love this flavor. She eat a Key Lime yogurt almost every day. Did you hear B&J's just came out with a new limited edition flavor? Cannoli! I can't find it in stores here yet but I'm dying to try it. Ha! I tried this before you for a change! I enjoyed this flavor, too, and I don't like lime! The lime swirl was the only strong lime aspect, whose strong tang I would have done without because I loved the lime ice cream. The best part for me was not the crust, which I thought was rather lacking sweetness, but the awesome meringue swirl. I want to see B&J's use this same meringue swirl in future flavors because it tastes very similiar to marshmallow fluff. Because I dislike tang and fruit in my ice cream but ended up enjoying this flavor, is the reason I always boast about B&J's being #1 in the ice cream business because they have taken flavors I normally dislike and make me like it in their ice cream. Please come back and let us know what you guys think when you pick some up. Cannolli -just- came out but I am searching feverishly for it! When are you going to review cannoli? Its been out nationwide for a few weeks now. You make a great point about trying new things such as the Key Lime. I need to be more adventurous in my ice cream selections; always stick with my favs. The cannoli is not out anywhere in my area yet either; think it will a little while. Ok so I was adventurous and was so thrilled to purchase this pint Monday morning. I like key lime pie so how could I not like this? Well this is downright nasty! I have never found an ice cream I hated until this pint. The crust was not abundant in every bite, the lime swirl reminded me of a sickly Windex taste (no I don't drink Windex), the only part I did like was the marshmallow swirl. Then to make matters worse, about 2 hours later I spent the night sick to my stomach (twice!) after eating this. It's funny because the only other time I had this reaction was another BJ flavor Pumpkin Cheesecake. Lemme just say I paid full price for this and it was a total waste! !